Have you ever experienced problems with stiff or stuck door locks, key’s that don’t work, loose door handles and or latches that don’t latch? Then continue reading for some simple solutions. There are many common problems that occur with old door handles and locks. However there is usually a solution to these before they become such a serious problem that the lock, latch or handles fail completely. It is usually down to a malfunctioning door latch or locking mechanism causing the problem, although each issue experienced will be different and needs someone with a little DIY experience and patience to fix. With opening and closing tens of times throughout each day, it comes as no surprise that door handles can come loose overtime. 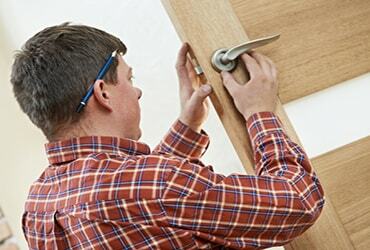 Tightening up the fixing screws that hold the handle to the door periodically will help to avoid wobbly handles. You will also need to check that the bolt through fixings and grub screw are tight from time to time. Old sprung door handles will require lubricating periodically, you will need to gain access to the flat coil spring which is located either under the rose if door handles on rose are fitted, or on the underside of the backplate if door handles on backplate are used. Once you have access use only a small amount of graphite powder for lubrication before fixing the handles back to the door. An internal door lock or 3 lever mortice sash lock, as they are sometimes named, may overtime become stiff or even stuck, this is usually because the lock is dirty or dry and needs to be lubricated. When lubricating door locks you should always use a graphite powder rather than oil based products. Oil lubricants including WD40 may seem to solve the problem, although a sticky gunge will fill your lock with time leading to complete failure at a later date. Whilst internal door handles, door locks and latches are relatively cheap to replace, external door locks can be costly, so if the problem cannot be resolved by lubricating the lock then rather than paying the callout charge of a locksmith you may decide it’s best to remove the hardware and take it into a locksmiths or hardware specialist for them to repair in store. They may recommend a replacement but you’ll still save on the callout charge. The various issues encountered with tubular door latches range from a drop or movement in the latch strike plate to a poorly fitted door or even the coil spring within the latch failing to force the latch back out. Misaligned door latches is a common problem which thankfully is easy to resolve. If the door latch is not operating smoothly, it’s most likely that the latch on the door may not be lined up with the strike plate on the door frame. Depending on the distance of the misalignment repairs range from making minor latch adjustments to repositioning the door. Once you have had time to determine the distance of the misalignment then one of the following methods could be the solution. For less than a 1/8 inch (2-3mm) misalignment, you can use a metal file on the inside edges of the strike plate to enlarge the opening. You may also want to try loosening off the fixings screws and move the plate slightly. For misalignments greater than 2-3mm then you shall need to remove the strike plate and increase the size of the mortice (hole) in the door frame, either extending the top or bottom of the mortice hole as necessary using a wood chisel. Reposition the strike plate and check the misalignment has been corrected before filling the gap with wood filler and refinishing the surface. If the latch isn’t reaching the strike plate, then you could try to shim out the plate using a thin piece of metal or wood behind the plate, you can also add another strike plate on top of the current one. If the latch still doesn’t reach then you can try doing the same with the door hinges, only replacing the door for one that is wider as a last resort. There are other less common problems that can be experienced with old door furniture, and while there can usually be a solution found, the time spent repairing locks, latches and handles can be more costly than replacing them, browse through the door furniture we offer at the lowest prices online.